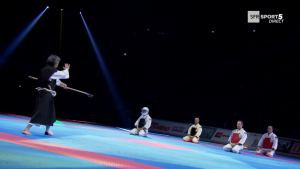 The 33rd Paris Martial Arts Festival, one of the most famous and the biggest martial arts show in the world was held. 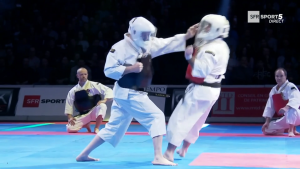 Hiroshi Aosaka sensei, who is a coach of the Franch Federation, Daihansih, 9th dan, and kenshi of the French Shorinji Kempo Federation performed a demonstration of Shorinji Kempo. 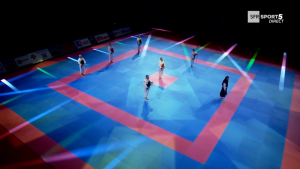 15,000 people gathered at the prestig-ious Accor Hotels Arena (formerly known as the Palais Omnisport Paris Bercy) on Saturday, March 24 to enjoy the show, which was broadcast on several television channels in European countries. Over 30 styles were represented between 8 p.m. and midnight. 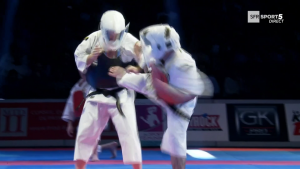 The event is organized each year by the biggest martial arts magazine in France, Karate Bushido. In recent years, people like spectacular demonstrations with speed, power, strength and break tests. Unfortunately, true traditional martial arts are scarcer. However, Shorinji Kempo demonstrates essence of Budo steadily even today. At the ideal time of 9 p.m., Aosaka sensei, 9th dan, and six kenshi stepped in. Aosaka sensei started off with a demonstration of two shakujo embu with two themes, kaze and kaza guruma. After that, kenshi performed shuteki toho. Aosaka Sensei then came forward once again, performing additional shuteki toho with kenshi. Trusting the enthusiastic applause that followed, the surprised spectators deeply enjoyed the demonstration, which lasted a total of seven minutes. The organizer was also very ap-preciative. The show went very well. 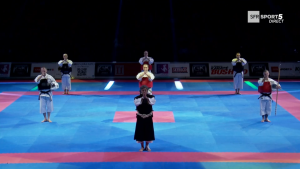 It could be watched on television all throughout Europe, and also was a significant opportunity for Shorinji Kempo. Aosaka sensei has partici-pated in this festival around ten times since 1980. At age 72, Aosaka sensei was the oldest expert of the event. Shorinji Kempo was widely spread in Europe, thanks to the ongoing efforts of Aosaka Sensei for now half a century. We hope and believe that Shorinji Kempo will keep growing. To all kenshi of the world, it was a great pleasure.